Warning: This guide is for Serious Investors only. If you are looking for penny stocks or day trading tips, you won't find them here. 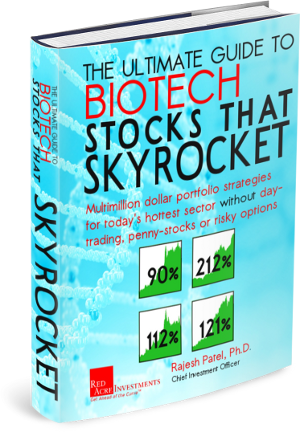 Enter your name and email address below to get your free copy of The Ultimate Guide to Biotech Stocks that Skyrocket. Key strategies for building a multimillion dollar portfolio with real world examples of high-profit stock trades that grew large and small accounts without day-trading penny stocks or risky options. A wealth-building strategy for busy professionals. How busy professionals with full-time jobs can still rapidly grow their portfolios. Common misconceptions that may be holding you back. From "efficient market theory" to "don't time the markets" we bust open common myths and show you what really works. How a misunderstood principle inherent to certain stocks can lead to exponential gains when applied correctly. How to get started. We'll show you the easiest way to get started applying these multimillion dollar portfolio building strategies for yourself (without doing over 80 hours of research each month). You can drive massive profits to your portfolio with just a handful of carefully selected stocks. Using this guide, you'll know exactly what type of stocks to look for, when to trade them, and the quickest way to get started building your multimillion dollar portfolio. Disclaimer: This is NOT an offer for Securities. By accessing this information you acknowledge that it does NOT constitute Individual Investment Advice. Investing in securities involves the risk of loss. Past results are NOT a guarantee of future success. You should consult your financial advisor about the suitability of investment styles and products for your portfolio and financial goals. Red Acre Investments is not a Registered Investment Adviser.